This week “Firimar” reached out to me with old photos of brothers Charles and Frank Mayall. 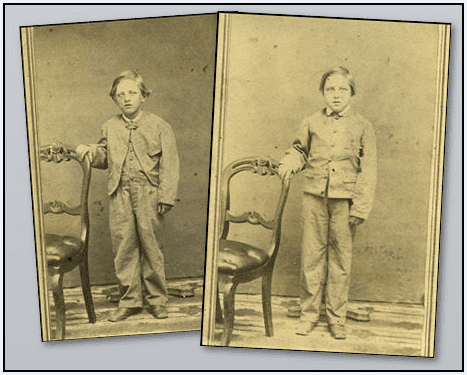 Thanks to “Firimar” I have now added a copy of each photo to Charles Alfred Mayall (1863- ) and Frank Emerson Mayall (1861- ). Photos: Charles and Frank Mayall. Source: Thomas Jay Kemp. Their lives were not easy. They lost their Mom when they were aged about 17 and 18 – then lost their father six years later. Frank moved to Helena, Montana, where he was prominent in business, and married Emma Florence Kimball, a Massachusetts girl, on Thanksgiving Day, 26 November 1896. But things took a sudden turn in 1903 when he became seriously ill and went to an asylum in Maine, where he died in December 1903. Charles married Jennie Moore on 4 September 1899 in Cambridge, Massachusetts. Life was looking up for Charles, but it took a turn in 1902 when he was arrested and later released for drunkenness – accused by his father-in-law, 74-year-old, recently widowed Nathaniel Gilbert Moore (1828-1920). Sadly, a year later Charles was again arrested for drunkenness. The marriage did not last and they were divorced soon thereafter. Life is difficult and can be complex. I am glad that “Firimar” took the time to share their pictures, so that we could add more to their story – and get a better perspective of their lives. Thanks to the Internet, genealogists across the world are quickly piecing together our global family – one obituary, one photo and one document at a time. Have you made the effort to connect missing photographs to the family? Sometimes when visiting an antique store, I’ll notice a section with boxes of old photos, and if time permits, will check to see if any of them are identified. If they are, I will make a careful record of the names, locations and any other information and go online to see if family members can be located. On one occasion, I found a nice portrait of a young man taken in Seattle around 1880 or so and managed to find a home for it with his granddaughter. She had never seen a photo of him as a young man and was overjoyed to tears to see how much he resembled her own son. I learned that the man had actually lived in Alaska, so how that photo came to end up in a shop in Florida remains a mystery. Or if no one minds, I take a careful pic of the old photo(s) front and back and proceed from there. The shop owners generally seem to be okay with it on a couple of levels since they enjoy the idea of reuniting these photos with family, and that someone’s trying to make a sale for them too. How do you go about finding your parents if you were put up for adoption? I have the name of the town they were born in. I have had two people contact me and they are my second cousins through a DNA test asking for help. Marcena- We have had some success in finding birth parents from newspaper articles, like obituaries. Other ways to search: 1. Ask your adoptive parents for info. 2. Go online and register your info in adoption reunion registries. 3.Contact the adoption agency for help. You can search the town that they where born in by the last names of your cousins in the census records. This will give you an idea of possible relationships and ages, siblings and parents names.